Byron York has a characteristically subtle and devastating critique of the Obama administration’s recent attempt to ruin Thanksgiving. The kerfuffle began when Obama’s still operating campaign arm, Organizing for Action, released talking points to convince relatives and friends to enroll in Obamacare over Thanksgiving dinner. Reluctantly, conservative blogger Ben Domenech responded with counterpoints. Watching from afar, York was reminded of an exhibit in Berlin explaining how the communists who ran East Germany for the USSR tried to make every personal event into a celebration of socialism. It’s crazy to think we’re in an era where the President of the United States is green-lighting not only massive increases in government-run health care, but also beseeching everyday Americans to make support for such interventions the topic of completely private, non-political family gatherings. York can be excused for sensing some totalitarian tendencies in the present administration. The parallels seem obvious. The launch of the Obamacare website for small businesses will be delayed until November 2014 – a full year from when it is required by law to go online. Along with the Obama administration’s inability to create functioning health insurance portals, today’s announcement is yet another craven attempt by Washington liberals to shield themselves from the political consequences of their failures. By pushing back the federally-run small business exchange (called SHOP) until after the 2014 midterm elections, President Barack Obama and Democrats in Congress want to avoid a fresh round of voter anger when the newest website inevitably implodes. But doing so means that three federal elections will have taken place between the time Obamacare passed into law in 2010 and its full implementation in 2014. That time period will cover half of the Obama presidency. If performance predicts the future, all we have to look forward to in 2014 is more failure. Republicans should spare Americans the experience and put forward a slate of candidates that run and win on a promise to repeal Obamacare, without delay. Most of us remember story of the “First Thanksgiving.” According to lore, in 1621, the Plymouth colonists, in what is now Massachusetts, and the Wampanoag Indians gathered to share an autumn harvest feast in first Thanksgiving celebrations in the colonies. In reality, history scholars general have concluded that this tale — and the idyllic images of Pilgrims and Indians sharing turkey and a hearty laugh – is pretty much total baloney. There is, however, a real, and much more important, story of hard work and bountiful harvests that should serve as the basis for Thanksgiving in America, because it ultimately became the basis for the America itself. In May 1607, King James of England sent three ships filled with 104 people to what is now the Tidewater region of Virginia to establish the Virginia Company. When they arrived, the settlers found themselves surrounded by a bountiful environment. Mussels, oysters and fish; turkeys and eggs; strawberries, raspberries and mulberries; deer and plenty of fertile soil were all readily available. Despite this abundance of food, all but 38 of the original 104 settlers died within six months of establishing Jamestown — mostly of starvation. Two years later, in the summer of 1609, the King James gave the Virginia Company another try. This time, 500 colonists were sent from England to Virginia to attempt to establish a permanent settlement on the coast of North America. The second time proved an even bigger disaster. Even in this land of plenty, 440 people — all but 60 — starved to death. The famine was so great that journals record at least one occurrence when several colonists resorted to digging up a newly dead Indian and turning him into a meal. Archaeologists recently discovered that a 14-year-old girl was also among those eaten. In a dire, last-ditch attempt to save the Virginia Company, the business’ leaders in England sent a British military officer named Sir Thomas Dale to asses the situation in Virginia and determine why the settlers were having such a hard time making it. Upon his arrival, Dale was shocked and confused to find that these starving settlers spent their time bowling in their yards, rather than farming or hunting. Dale realized the reason the settlers were so lazy even in the face of their hunger was because they were being asked to work for the common good. For the first seven years after arriving, the settlers had no ownership of the fruits of their labor. Everything the settlers produced went into a shared storage area and they were all allocated equal amounts to feed their families, no matter how hard they worked or how much they personally produced. There was simply no incentive to work hard — the laziest person got as much to eat as the hardest working person. Thomas Dale changed all of this by introducing private property to the settlers of the Virginia Company. Dale allotted each man three acres of land, and anything grown on that land was his to keep, trade or sale as he wished. It was also declared that no man would be forced to work on communal efforts, such as building churches or clearing roads, for more than one month per year — and never during planting or harvest season. After Dale implemented this system of private property to take the place of communal farming and equal distribution, the colony flourished. By the time he left Virginia three years later, the colony had grown by hundreds of people and the settlers were well-fed and in good spirits. The system of private property rights Dale created in Virginia gave settlers the incentive to work hard and be frugal. It also allowed settlers to trade the food they grew or hunted to people willing to develop new crafts and vocations. As a result, and with a good deal of experimentation and innovation, some settlers were able to specialize in trades such as blacksmithing, milling, carpentry and tanning. By introducing private property rights and a sense of personal responsibility to the Virginia Company, Thomas Dale didn’t just save the lives of a few hundred settlers four centuries ago. He managed to inject this continent with the principles of private property, free enterprise and individual liberty — that have served as both the foundation for, and the guiding force of, the United States. Because of Thomas Dale, and the advancements and innovations that resulted from his simple idea 400 years ago, we all live in a richer, safer, healthier, more peaceful and better world. For that, we should all be truly thankful. In celebration of Thanksgiving, the Taxpayers Protection Alliance named its annual “Turkeys of the Year.” The awards are presented in recognition of federal programs and agencies that have proven to be real turkeys for taxpayers, gobbling up tax dollars and giving hard working Americans the bird. Among this year’s “Turkeys of the Year” are the IRS, Obamacare and the Export-Import Bank. Check out the Taxpayers Protection Alliance’s short video to see just why these three boondoggles were so deserving of the shameful award. Alex Saleh recenty joined the growing number of American business owner to install a surveillance system. What makes the Miami Gardens, Fla., convenience store owner different is that he didn’t get the cameras to keep an eye on shoplifters or cash register robbers, he got them to film area police. After years of watching cops harass his customers and employees, Saleh had enough. One of his employees was stopped and questioned by police officers 258 times over a four-year period. The employee was arrested for trespassing 62 times – just for being at the place where he worked! In all, even though the convenience store had never been robbed, Saleh was forced to install 15 surveillance cameras. 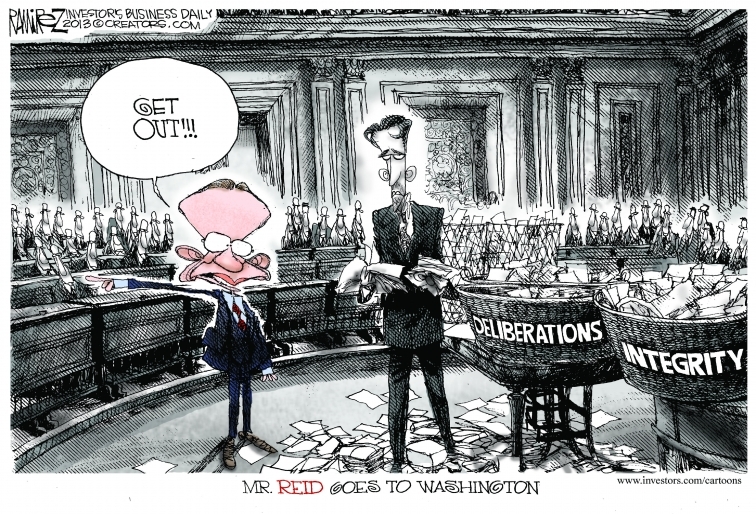 Quin has a must-read idea about how to turn Senate Majority Leader Harry Reid’s (D-NV) filibuster nonsense into a political winner for the Republican Party. For me, the attractiveness of Quin’s idea is its attempt to re-inject much-needed attention on the deliberative process in lawmaking. For the first time in years, the Senate – and especially the Republican bench – boasts a bevy of thoughtful debaters like Ted Cruz (R-TX), Mike Lee (R-UT) and Rand Paul (R-KY). Rather than speechmaking marathons where one person must speak until exhausted, America would be better served hearing, for example, Cruz and Tim Kaine (D-VA) debate immigration policy. The possibilities abound. Imagine a debate between Paul and Chuck Schumer (D-NY) on fiscal and monetary policy. Or between Lee and a Democrat-to-be-determined on any clause in the Constitution. By making the filibuster vote threshold drop with every round of voting, opponents of a measure must either win converts or lose the majority. Either way, the legislative process is made better because the senators elected to represent the public are putting their reasons on the record. My quick summary doesn’t do enough justice to Quin’s piece, which you can read here. At a time when so much of government seems broken, it is refreshing to read a piece that offers a workable solution. A few weeks ago, I wrote a column here entitled “America’s Fascist Moment.” I generally try to avoid such loaded terms in print, but the reason I used that other F-word was precisely because we’ve allowed its common connotation to obscure its actual meaning. People usually associate ‘fascism ‘with the worst kinds of authoritarians, especially Adolf Hitler. And, true enough, Hitler was an extreme example of a fascist at work. Generally, however, fascism is a bit more subtle than that (really, though, what isn’t more subtle than the Third Reich?). What the term actually means is erasing the lines between the state and civil society; ensuring that everything we do is tied to the government. In the famous formulation of Benito Mussolini, it’s “All within the state, nothing outside the state, nothing against the state.” Needless to say, that’s about as far away as you can get from the traditional American notion of limited government, where the state is only valuable insofar as it serves the people, not the other way around (for the single best volume on this, I recommend Jonah Goldberg’s truly fantastic Liberal Fascism). When history renders its ultimate judgment on the Obama Administration, any fair reading will note the deep fascist tendencies that pervade this Administration. If you need any proof, you need only look at the headlines of the past few days. First, you’ve got the President exhorting his disciples to use Thanksgiving dinner to harangue family members about Obamacare, even going so far as to provide pages worth of printable talking points to his minions (I recently took this up at Ricochet). Then you’ve got the Administration’s continued efforts to force employers to violate their consciences and provide birth control for their employees even if it violates the teachings of their faith, a fight that it was announced today will head to the Supreme Court in the spring. Finally, there’s the news that Obama’s Treasury Department is proposing cracking down on tax-exempt status for non-profit groups that engage in what the Administration believes to be too much political activity. Liberals and conservatives alike should understand the grave danger that would come with giving the Executive Branch that kind of power to regulate political activity. There’s no such thing as a free polity where those in power get to punish those who aren’t simply for voicing their opinions. Having a free society, however, doesn’t seem to be a priority for the Obama Administration. This is an Administration that would rather beat its enemies while violating the noblest traditions of American government than lose because they stood on principle. You’d be hard-pressed to think of another White House that ever threatened liberty so directly and so consistently. After decades of kicking the financial can down the road, some of America’s biggest cities now want to try throwing it up the ladder. Starting January 1, Detroit will move its retirees to Michigan’s federally-run Obamacare exchange. Instead of the previous full coverage paid for by taxpayers, each retiree will get a $125 monthly stipend. The move is projected to save the city roughly $120 million. Chicago and other cash-strapped cities are considering similar options. But the move to offload state and local obligations onto federal taxpayers is just getting started. Writing for City Journal, Steven Malanga explains that municipal debt related to unfunded pensions far outweighs the amount owed to retiree health benefits. To big city mayors the solutions, of course, are identical – Ask Uncle Sam for a bailout. At some point, America’s entitlement culture – up and down the socio-economic ladder – has to take a back seat to fiscal reality. We’ll see if enough people are ready to have such a debate when the 2016 presidential election rolls around. This week’s CFIF TechNotes – happy Thanksgiving week, and enjoy! After the slow start to enrollment in the Obamacare marketplaces for 2014, the Obama administration is set to delay enrollment for 2015 by a month. The Health and Human Services Department confirms to CBS News that it plans to reschedule the 2015 open enrollment period for Nov. 15, 2014 – Jan. 15, 2015. Previously, the enrollment period was slated to run from Oct. 15 – Dec. 7, 2014. Insurers also now have until May 2014, rather than April 2014, to submit applications to offer health plans in the marketplace. The changes don’t impact the Obamacare marketplace for next year. Make no mistake, “Set premiums accordingly” means raise prices based on the internal logic of Obamacare. The Administration knows that Democrats will take a drubbing at the ballot box if yet another round of bad news and increased premiums coincides with the final days of next year’s midterm elections. This is nothing more than a face-saving measure, and one so laughably transparent that it’s not liable to do Democrats much good (especially if Republicans make the Administration’s intentional attempt to conceal health care rates a campaign issue). It’s a shame the Obama Administration has gotten on the wrong side of so many doctors. They could use some triage right about now. California’s Obamacare-aligned health insurance exchange will not bail out President Barack Obama. Data released by Covered California, the state’s exchange, explains why. “People between the ages of 45 and 64 have enrolled in California’s health exchange at a much higher rate than their overall portion of the state’s total population, while younger adults’ enrollment levels essentially track their overall population,” reports CNBC. In other words, Covered California – like any other Obamacare exchange – can’t afford President Obama’s costly ‘fix’ that would allow young and healthy people to keep their pre-Obamacare insurance plans and stay out of the post-Obamacare risk pools. As I explain in my column this week, doing so would lead to the dreaded ‘death spiral’ that will doom the Obamacare exchanges. There’s no other way to say it. California’s refusal to go along with Obamacare’s latest ‘fix’ is a huge blow to President Obama. So far, the Golden State is home to the most Obamacare-related enrollments, so if it’s afraid that adopting Obama’s enforcement delay will put its fiscal sustainability in jeopardy, it’s hard to see how any other state that’s serious about the issue will disagree. A quick thought regarding the avalanche of remembrances of John F. Kennedy’s assassination, which happened 50 years ago tomorrow. As we all know, citing where you were when Kennedy was killed is a generational touchstone for a wide swath of Americans. That’s sort of a broader metaphor for this macabre exercise in nostalgia. Watching the coverage, it’s remarkable (though, alas, not unusual) how much certain Baby Boomers are making it about themselves. Much of the noise surrounding the anniversary has much less to do with Kennedy himself than it does with their nostalgia. The Me Generation may be going gray, but they still haven’t lost that ethos. One other note: It strikes me as perfectly fair game to try and figure out Kennedy ideologically. You’re hearing a lot of people on the right now point out that he was a tax-cutter, a staunch anti-communist, and someone who embraced America’s global leadership role. All true, and all fair points. We’re putting more weight on Kennedy’s legacy than it can bear, however, when we indulge in counterfactuals that imagine what would have happened if he hadn’t been killed. To hear certain pundits tell it, JFK would have ended the war in Vietnam before it really started; or he would have eventually become a Republican. It’s basically a “choose your own adventure” book where JFK miraculously always turns out to be exactly who you wanted him to be. It’s a testimony to how iconic a figure Kennedy was that he invites this kind of speculation a half-century after his death. Let’s remember, however, that it’s all just that: speculation. We have enough contemporary political battles to fight without trying to baptize a dead president into our present-day ideologies. Destroy the Country! Yeah, That’s It!!!! Egads. Since when do we need a president to move our nation forward? Lord forbid that we need a president or a government to move American forward. I thought that was our job as individuals, while government was just there to protect us and ensure our basic freedoms. I guess I made the mistake of actually studying and understanding American political theory and history, while the morally superior folks like Capehart knew they could put all that aside and instead assume a class of elite managers in Washington is best able to move us forward because we just are too inept to do so on our own. Ignoring any policy proposals he doesn’t like allows Capehart to blast Republicans for “failing to have viable alternative proposals worthy of national debate.” Note the qualifiers. And who, pray tell, gets to decide what is “viable” or not and what is “worthy of debate”? None other than lefties like Capehart. Never mind that Republicans and conservatives for years have pushed policy alternatives on just about every important national issue under the sun, only to be — if one applies his own terminology to his side as well as ours — “blocked” by the “obstruction” of Democrats. Calling for the parties to work together (by which he obviously means Republicans should work to do what Democrats want), Capehart on one hand blames Republicans for poisoning the well while on the other hand doing some serious poisoning of his own by asserting as a stated fact, that “Half of the legislative branch is in thrall to a band of right-wing zealots unmoved by facts as much as they are motivated by hatred of the president.” Yeah, that’s it: Accuse the other side of nastiness while insulting it in ways you would never accept if aimed at you. That’s just a great way to promote healthy dialogue. Somebody needs to teach Capehart some manners. And some civics lessons, too. Google likes to promote itself as a green, environmentally conscious company. After all, the company stays busy lobbying for carbon tax and cap-and-trade schemes, encouraging government to shutter coal plants and building solar farms. In reality, however, as I point out in a piece featured today on The Blaze, Google is far from green. The company’s executives control a fleet of private jets that they use to gallivant to vacation spots around the globe – burning an average of 100,000 gallons of fuel every month. The supposedly environmentally conscious company’s jets have emitted more than 100 million pounds of carbon dioxide over the last four years alone. What’s worse is that you are helping to fund Google’s green hypocrisy. Google, thanks in part to its hefty campaign donations and cozy relationships with federal lawmakers and the Obama Administration, gets to park its jets in a taxpayer-funded NASA hangar and purchase its jet fuel at below-market prices from NASA and the Department of Defense. Google officials spent an estimated $29 million on jet fuel at the facility, roughly $10 million less than what they would have paid on the open market. America’s century-old telephone networks using analog and physical switch technology served us well from the days of Alexander Graham Bell to the dawn of the Internet. Twenty-first century technology, however, demands a smooth and rapid transition to Internet-Protocol (IP) services. Some of the usual anti-market activist suspects, such as Public Knowledge, fear that the FCC’s comparatively limited authority to overregulate the Internet in the same way that it did existing telephone networks will mean a reduced ability of federal regulators to meddle as communications technology advances. The reality, however, is that the transition to broadband and IP services has already begun as consumers freely migrate to more advanced connection methods. The FCC should focus on what works in the real world, rather than hobble technology’s advance on the basis of unfounded fears, so this week’s announcement marks a welcome and positive milestone. All four of the cyber security experts that testified before a House committee yesterday agreed that Americans should not use Healthcare.gov until its security features are enhanced, or in some cases, built. Three of the four said the website should be shut down until the security problems are fixed; preferably by rebuilding the site from scratch. While that may sound drastic, an Obama administration official responsible for developing Healthcare.gov says that up to 40 percent of the site isn’t finished yet – including the parts that deliver subsidies to insurance companies on behalf of qualified Obamacare enrollees. And it’s not like the roughly 60 percent of the website that is completed is running smoothly, as HHS Secretary Kathleen Sebelius discovered when it crashed while she was demonstrating its (in)effectiveness to the public. Brace yourself. There is much more to come. A. Barton Hinkle, a Richmond Times-Dispatch columnist and Reason magazine contributor, wrote a fascinating and chilling column this week about the Food and Drug Administration expensive and burdensome new menu labeling scheme. The calorie posting regulations, which are expected to go into effect any day, have been debated for three years. Why? Because it’s confusing as hell to try to figure out how to force business owners to post the calorie count for custom made food orders. Consider, for example, pizza: The legislative director for Domino’s says ‘there are 34 million pizza combinations. We’ve done the math.’ Listing the calorie content for each possible variation would require a very large sign indeed. Yet only one Domino’s customer out of 10 visits a Domino’s location. The rest order over the phone or online. So shouldn’t posting the caloric content on the company website suffice? It should, but it will not: The FDA’s proposed standards require actual signs, at every location. While the regulations are bad news for big companies like Domino’s, at least they can make the calculations once and send those numbers to every location in their chain. It’s the small mom and pop pizza and sub shops, diners and other restaurants that face the worst burden. After all, small businesses don’t have the technology, money or time available to figure out the number of calories contained in a sandwich or a stew with hundreds of possible ingredient combinations. The goal of these ridiculous federal calorie count regulations (which are actually a tax on businesses’ time and money) is, of course, to encourage people to consume fewer calories. So, to recap, the government will soon hand down regulations that will be impossible to fully meet, will cost businesses considerable amounts of time and money, and will do nothing at all to benefit Americans. Perfect. Just what this country needs.